While analytics and quantitative analysis have wormed their way into virtually every sport in some capacity, there remains some hostility between stat-heads and major professional franchises. Baseball, consisting of easily-quantifiable discrete events and featuring a plethora of fancy tracking technologies such as PITCHf/x, is no stranger to this intellectual gulf. Even though teams like the Oakland Athletics and Pittsburgh Pirates have embraced data and built up sizable Analytics groups, writers for stats-heavy sites such as Baseball Prospectus still lament managerial decisions such as the proper way to use a closer and create a lineup. Tradition-bound managers and writers scoff at some sabermetric proposals and the two parties remain at an effective impasse until a more forward-thinking manager or owner actually applies them in a real professional baseball game. In The Only Rule Is It Has to Work, the current (Sam Miller) and former (Ben Lindbergh) Editors-in-Chief from the aforementioned Baseball Prospectus, attempt to serve as that forward-thinking manager/owner. The pair take over the Sonoma Stompers, an independent baseball team in the Pacific Association. While they do try some wacky things during the course of the season, they soon realize that implementing their plans won't always be easy and that their players are more than lab rats. The Only Rule ends up as more of a memoir of a demanding, rewarding, frustrating, and most importantly to the reader, entertaining season in the wacky world of independent minor league baseball team that is a little more data-driven and iconoclastic than its peers. The Stompers operate on one of the lowest rungs on the professional baseball totem pole. Certain independent leagues such as the Atlantic League feature a variety of former MLB pros (I remember seeing Jose Canseco and Rickey Henderson play for the league's Newark Bears as a kid) and boast a quality of play similar to AAA. Meanwhile, one of the best players in the Stompers' league and a constant bugbear to the team is eventually poached by a high A affiliate of the San Diego Padres, one of the very few Pacific League players who rises to an MLB affiliate at any level. There is a football goalpost in right-center field of the Stompers' stadium. Jose Canseco played for the Stompers for a brief spell in 2015. And then he played for another franchise in the league shortly thereafter. In short, this is not the big time, the league is viewed as a stepping-stone, and some weird stuff is prone to happen. The Only Rule covers every aspect of the Stompers' 2015 campaign, from identifying potential players and conducting tryouts to the final game of the season. The player selection process is an early highlight of the book. Miller and Lindbergh, with the help of some statistically-inclined baseball friends with MLB-team experience, create a spreadsheet that measures the performance of undrafted college players and attempts to identify diamonds in the collegiate hardball rough. They not only need to figure out which players are worth signing, they also need to woo these athletes with the very few perks and funds at their disposal. This ultimate fantasy draft is a sabermetrician's dream and one of the few areas where Lindbergh and Miller are able to exert a very high level of influence. On the subject of influence, the authors are severely hamstrung by a double-whammy of occasionally obstinate managers and frequent Stomper defections to greener pastures without football goalposts in their outfields. The Stompers go through multiple managers in 2015 and they experience some friction with all of them in adopting their strategies. The authors serve more as consultants than dictators, and the final decision is usually up to the manager. Miller and Lindbergh make some convincing arguments backed by sound data but some managers still refused to follow the two's recommendations. Lindbergh and Miller are still able to get their way with certain tests, including some unorthodox fielding shifts with a five-man infield, but they do not have full control over the team or its tactics by any means. This setup likely prevented the two from employing some of their odder plans and shifting fielders or tinkering with pitching roles more often. Additionally, the Stompers' dominant start to the season is eventually curtailed by losing a huge number of their best players to higher-level independent leagues. While this has a big negative impact on the team's performance, these departures also count as successes. In the epilogue, Miller posits that the primary goal of the Stompers is to develop talent and ensure that the best players are able to advance to higher leagues. Young players on affiliated teams have dedicated and talented full-time coaching staffs which allows them to develop skills far quicker than independent leaguers with part-time coaches of lower quality. Thus, it is crucial for teams to ensure that their strongest players with affiliated potential are able to catch scouts' interests and advance their careers. A large portion of The Only Rule centers around the good (and middling, and bad) players making up the team and a synopsis of the team's performance rather than just the experimental results. Lindbergh and Miller spend a ton of time interacting with the athletes, giving them playing advice, cutting together films of opponents, and bonding over heated games of the original (and best) Super Smash Brothers in the clubhouse. The Stompers are comprised of a diverse and engaging cast of characters, including the first openly-gay professional baseball player (who is warmly albeit slightly crudely accepted by his teammates), a mercurial player-manager with a distaste for analytics and meddling, and of course, a 50-year old Jose Canseco. It all makes for rather interesting reading. Lindbergh and Miller alternate author duties after each chapter and both are capable writers. The narrative never feels disjointed even with the authors trading off. Both are able to inject excitement into on-field game action and capably elaborate on some more abstruse sabermetric concepts like wRC+ and leverage, as well as some random references to stuff like Wrestlemania 2004 and Twitter baseball memes which resonate with their target demographic. There are no complicated equations and every advanced metric and daunting acronym is distilled to its essence for easy digestion by even the most math-averse. Overall, The Only Rule was a lot of fun to read. I found myself getting emotionally invested in the Stompers' season and rooting for not only the players but also Lindbergh and Miller. I felt a considerable sense of relief and excitement when the authors' five-man infield shift won over a skeptical Stompers manager by neutralizing one of the league's best hitters. While baseball analytics isn't really the focal point of the book, I did pick up some compelling strategies and concepts and learned a good bit more about baseball. 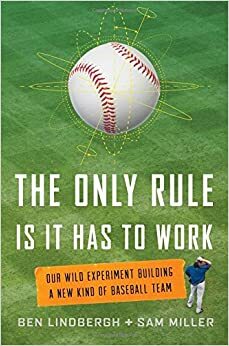 The Only Rule is a worthwhile read for any baseball fans with one iota of interest in sabermetrics. Fans of the authors' Effectively Wild podcast and readers of Baseball Prospectus and FanGraphs should especially enjoy it.